MAN AND MANKIND’S best scientists have studied for centuries and for thousands of years on what one should eat to live. Now this great knowledge comes from the Mouth of The Wisest of them all to Guide, Teach, and Train the victim (you and me) of the world. We should be thankful for the attention, sympathy, mercy, and forgiveness from such a Great One as God in the Person of Master Fard Muhammad. 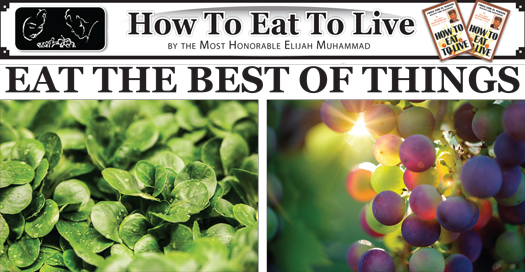 THE GREAT STRESS of ‘How To Eat To Live’ is made upon one meal a day. There is no doubt that one meal once every 24 hours of the right food will lengthen our lives and produce better enjoyment of our lives. Some of the various kinds of foods, of which you have no knowledge of its reaction in the stomach before you eat it, shortens the life. Never say that you will eat anything. Say that you will eat the best of things. Number 2: Beans that cattle should eat. And, that is what they are made for and not for human consumption. Lima beans, butter beans, field peas, black eyed peas, and even soy beans are not good for anything but for shortening your life. CORN BREAD, half-done flour bread, and sweet potatoes, all shortens your life. The sweet potato is not good for any human to take as a food. White potatoes do very well but they produce too much starch which would add fat, and too much fat shortens the life. This, I want you fat readers to remember; that your rolly, rosey fat does not mean long life. It means short life to you. Stay away from eating corn bread. It is too rough for the stomach. It wears out the stomach like sand grinds away a delicate rug on your floor. THERE ARE MANY vegetables that we could eat if the right kinds are pointed out to you. Stay away from collard greens and cabbage sprouts, such food is horse and cattle food. 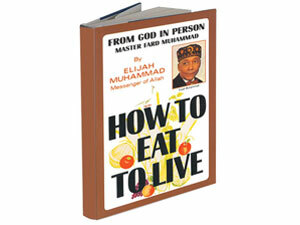 Oh, I know what you may say, my Black Brothers and Sisters, “I have been eating it all my life and my grandmother and father ate it and they lived 65, 75, or 80 years.” That is no time to live! You need to live not under 100 years, and from that to one thousand years. But, your life depends on what you eat. What you eat keeps you here and what you eat takes you away.